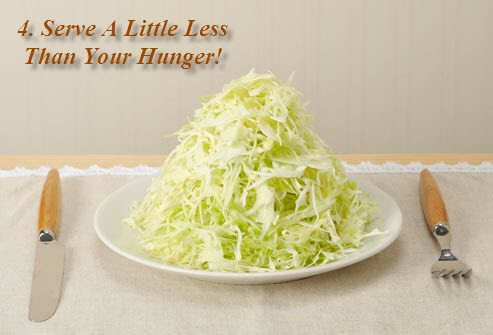 Mindless eating is a huge obstacle in your attempt to lose weight effectively. Nevertheless, you can follow certain tips to evade the tricks of your mind that promote unhealthy eating habits. The best way to beat the temptation of mindless eating is not to rush through your meals as it can make you overeat. Furthermore, do not deprive yourself completely of your favorite foods, especially in the beginning. So, grant yourself the privilege of having comfort foods, but in small amounts only. You are likely to eat more when you serve more. In fact, people tend to eat as much as 90% of their plates, even if they are not hungry. 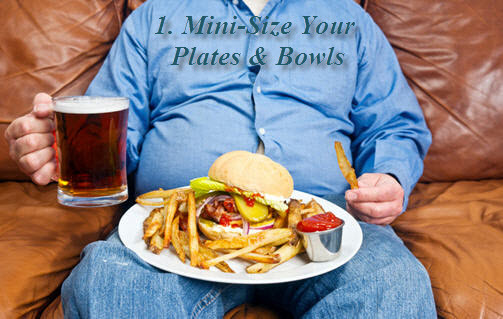 So, trick your mind by eating in small plates and bowls so that you take smaller portions of food. In addition, choose serving spoons of relatively smaller sizes. Eating with chopsticks, too, is a good idea. Similarly, when drinking a beverage, take small sips. It has been observed that taking small sips of liquids encourages you to eventually consume less. Preferably, take your beverages in tall, narrow glasses. If you do not want to eat mindlessly, then make sure you see all the food you eat. Simply put, it means that you should transfer the contents of the box or packet of snacks in a smaller plate for eating so that you can actually see the amount of food you are taking. Hence, it can help you keep a track of the quantity of snacks you consume and avoid overeating. 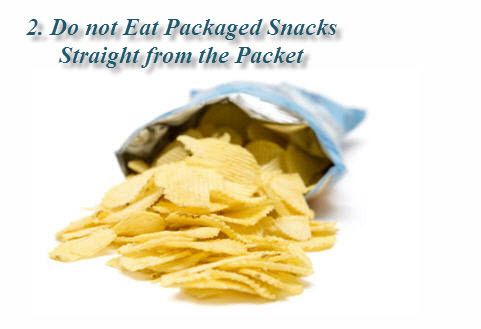 Plus, it is usually suggested to purchase individual-sized packets. However, those of you who find family-packs more convenient and affordable can store the snacks in containers and serve the food in a separate dish when you want to eat it. 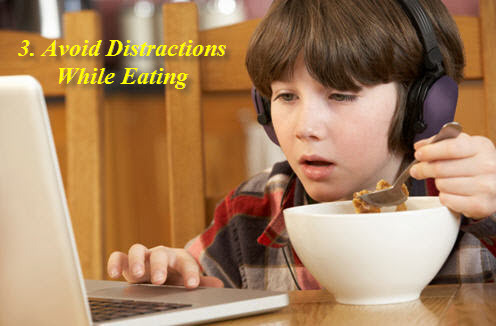 Another effective tip is to make a habit of eating meals as well as snacks at the table. This shall help you avoid impulse eating when you are watching TV or engrossed in some other activity. Do not take your meals in front of the TV, especially when you are glued to your favorite show as you may not realize that you are stuffing your belly beyond your hunger. Eating a little less than what you would normally eat is a healthy habit because it aids in digestion and does not make you feel sleepy or lazy after eating. Hence, you can satisfy your huger by eating about 80% and keeping a 20% margin. Usually, people do not even notice this 20% less consumption. This is perhaps the most common yet ignored advice. 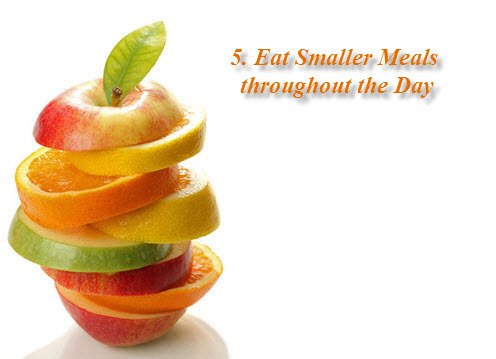 Eating small meals at regular intervals helps you avoid overeating. Taking small, frequent meals is also beneficial when dealing with digestive problems. More often than not, people skip meals in order to lose weight, but end up eating more than their usual appetite when they sit down to eat. In addition, when you take fewer meals, your body tends to store more for its ‘reserve’ rather than burning the calories. Thus, instead of going for longer periods without eating anything and eventually gorging yourself at dinner, take healthy snacks like nuts, sprouts, air-popped popcorn, fruits, etc. from time to time. Plus, make sure you chew your food slowly and properly, and follow the 20% rule. Needless to say, do not eat when you are not hungry. After all, mindless eating is all about eating without following your body’s signals. When you finish eating a meal, it takes about 20 minutes for your brain to receive the message that your stomach is full. 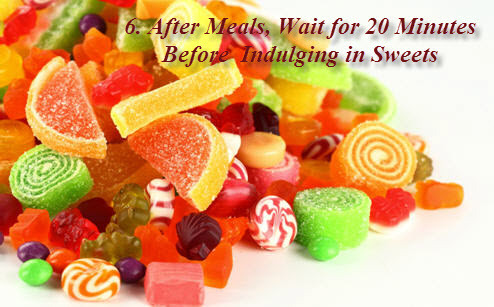 Thus, when you have taken your meal and craving for a sugary treat or dessert, just wait for around 20 minutes. Most probably, your craving will have subsided by the time you get up to grab something sweet.